Myconnect as symbiotic interspecies connector made of organisms with it’s circuit of signals and impulses, that are generated and translated by biological and technological organisms performs an immersive experience of symbiotic interdependence. 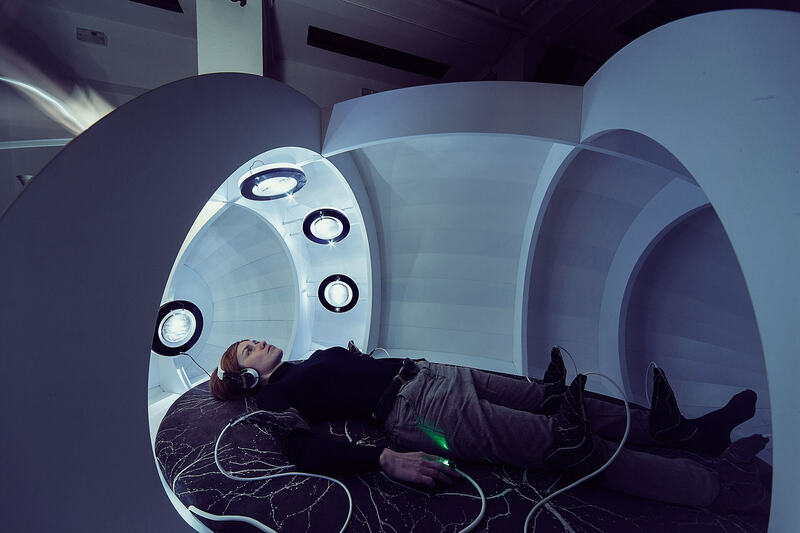 In the Myconnect capsule nervous system of a person is integrated into human-interface-mycelium feedback loop via heartbeat. Mycelium’s oscillations of electrical resistance than generate temporal offset of the incoming heartbeat, that is transferred back to the human body via sound, light and haptic sensory impulses. Transferred sensory experience of the body tries to indicate the dependence of understanding of reality from the sensory impulses of the environment, while symbiotic link points out the integration of human being in the multilayered network of his or hers habitat. Myconnect is a symbiotic interspecies connector that questions anthropocentric division of nature-human-technology. 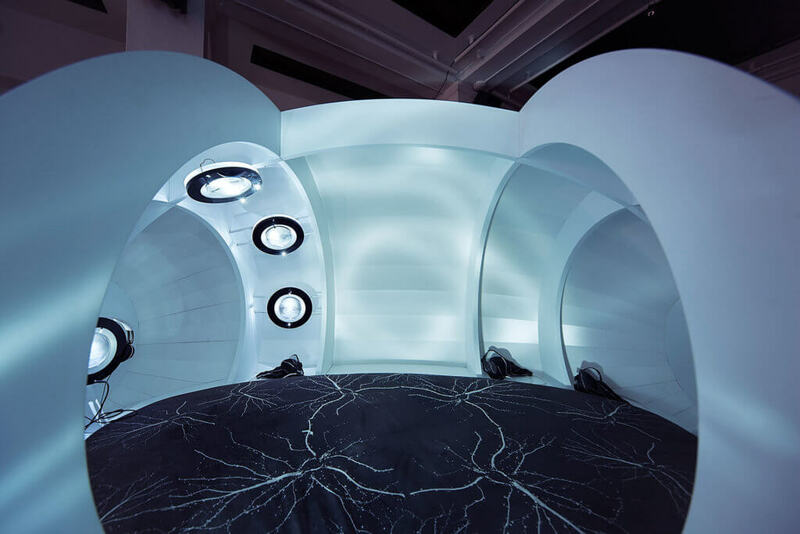 With its circuit of signals and impulses, that are generated and translated by biological and technological organisms, Myconnect performs an immersive experience of symbiotic interdependence. Through this experience distinction between nature-man-technology can be seen as an arbitrary definition that serves particular biopolitical interests in human society, which can than be shamelessly wrapped in an ideology of utilitarianism and may conceal excessive exploitation. Myconnect creates an experience of connectedness, of unqualified immersion through the sensory system of the body. 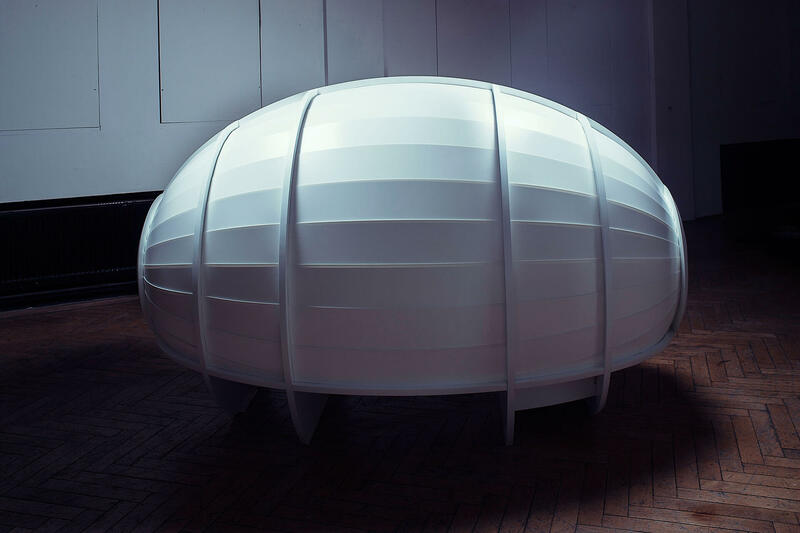 The experience of symbiosis in Myconnect capsule is somewhat isolated, like microbiological cultures are isolated in a laboratory. In Myconnect symbiosis is purposefully separated from the environment in order to make it visible, audible and haptic for the visitor. Myconnect is a neural connection, a sort of ‘tsaheylu’ from the sci-fi film Avatar. Tsaheylu means in Na’vi language a bond, a neural connection of two beings on Pandora planet formed via their neural queues. Na’vi connect to animals or plants that possess a neural whip or antenna. Neural connection can be formed also between two Na’vis during mating supposedly forming a strong, emotional, lifelong bond. Tsaheylu enables Na’vi deeper understanding of their environment since any emotion or pain is felt on both sides of the neural queues. Na’vi extend and transgress their body. They are becoming the environment thus blurring the body-environment division. In the context of Myconnect such a neural connection, a ‘tsaheylu’ is formed via ‘mycosynapse’, a two way communication synapse that enables a constant becoming of the symbiotic connection: one way leads from a heartbeat sensor to the fungal mycelium and the other from mycelium to the human body via vibration motors, light and sound. Fungal mycelium seemed to be a perfect organism to form an interspecies connector for multiple reasons. Mycelium as the vegetative part of fungus consists of a mass of branching, thread-like hyphae, a network structure that may be minute, forming a colony that is too small to see, or it may be extremely extensive. Thus, mycelium as such vast almost planetary organism seems as a perfect network to get plugged into and experience oscillations of the electrical current that flows through it. During our research we discovered that electric resistance of the mycelium is the perfect quality that we can use for real-time purposes. Continuous oscillations of resistance in the mycelium can be experienced also in spacetime of our own species. Mycelium has multivalent connections through branching and nodal connections allowing for material to pass around it in all directions. As an interconnected network, it is able to accommodate ‘flows’ principally of water and nutrients, in all and any direction around its structure. This kind of symbiotic connection is already a part of mycelium’s becoming in the Earth’s ecosystem. It forms symbiotic association between the fungus and the root of vascular plant, named mycorrhiza. In other words, a biological interspecies connector, a mutual association that provides the fungus with relatively constant and direct access to carbohydrates, such as glucose and sucrose, is already a part of its nature. The carbohydrates are translocated from their source, usually from leaves to root tissue and on to the plant’s fungal partners. In return, the plant gains the benefits of the mycelium’s higher absorptive capacity of water and mineral nutrients due to the comparatively large surface area of mycelium: root ratio thus improves the plant’s mineral absorption capabilities. Mycelial fungi combined with their versatility, requirements for growth, and reproduction increase the probability of interactions; they become more frequent and more obviously manifested. 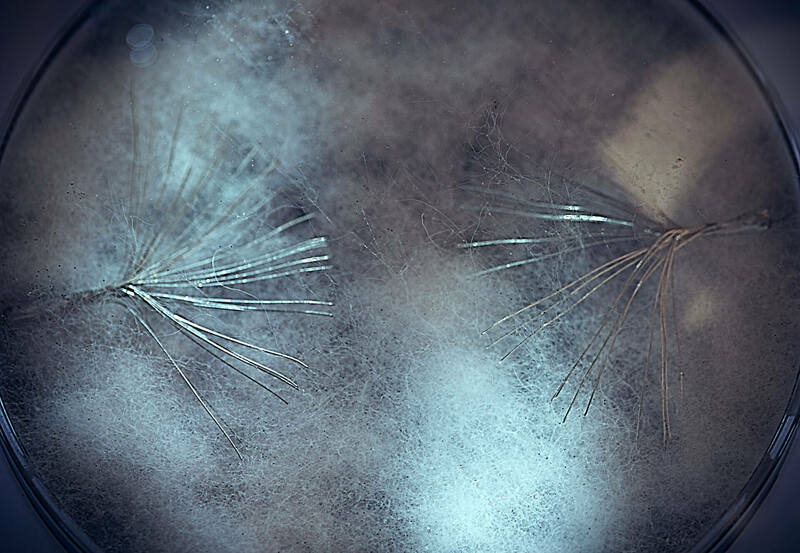 Gilles Deleuze proposes the fungal mycelium, with its network of hyphae and fruiting bodies as a metaphor for the metaphorical space of rhizome inhabited by meaning. The ‘flows’ of mycelium are precisely what is required in metaphorical space of rhizome in order to facilitate the becomings, connections, affects and meaning. Todd May elaborates by saying that concepts do not stand alone and isolated, they link up with other concepts, coexists with them on a plane of immanence that allows different concepts to resonate together in a multitude of ways, creating meaning, creating context, mapping a rhizome (May, 2005: 19). In the same way the body of human being does not stand alone in the environment, it is rather plugged into the environment and it’s existence is generated by connections that affirms them. By making new connections with other biological species and environment one might step out of anthropocentric perspective even if for just one moment to experience fresh air of other possibilities. Rajchman, J. (2000). The Deleuze Connections. Cambridge: The MIT Press. Stamets, P. (2005), Mycelium Running. Ten Speed Press.